Had the Congressional Budget Office done the math, as outlined in the table above, it might not have appeared so nonchalant about the prospect of Treasury paying the historical average interest rate on the massive federal debt. The historical average interest rate paid by the Treasury Department from 1990 - 2013 calculates to 5% and to 7% from 1971 – 2013. The current average interest rate paid by Treasury across the range of maturities is 2.4%. 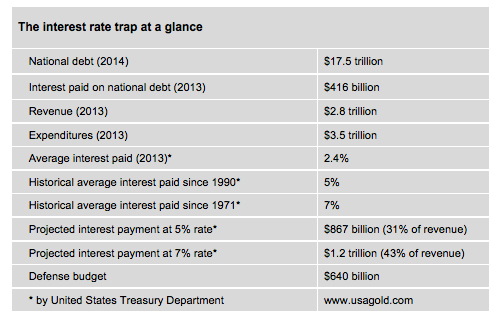 At 5% Treasury would more than double its interest payments from $416 billion annually to $867 billion. At 7%, Treasury interest rate payments would balloon to $1.2 trillion nearly triple the current interest payment annually. Tax revenues amount to $2.8 trillion. As a result interest would take up 31% of revenues at the 5% average rate, and 43% at the 7% average rate. In short, the federal government might be seen by the rating services in either instance as ultra-high risk, or possibly even technically bankrupt. As it stands the St. Louis Fed puts the sovereign debt to GDP ratio for the United States at 103.3%. Anything over a 100% ratio is considered over-indebted. Keep in mind that the federal government will have added nearly $1 trillion (or more) to the national debt when fiscal year 2014 comes to a close end of September, and no one sincerely believes that the borrowing is going to come to a standstill, or even that it is going to be cut significantly. The federal government in short is ensnared in a debt and interest rate trap of its own making from which it will be difficult to extricate itself. Pundits and market analysts alike might believe that the Fed is going to raise interest rates at some point in the future, but the reality of higher interest rates might bring far worse consequences than can be achieved by simply staying the course. Some small, even token, rate hike is tolerable, but a return to historical norms could reap consequences in the general economy far beyond the direct effect on the federal government’s fiscal status. It is a matter of convenience, perhaps even good politics, to be discreet about the relationship between the Treasury’s debt, its associated interest rate burden and the Fed’s ability to raise rates. Sooner or later, though, the Federal Reserve and the Treasury Department will be faced with the hidden and unavoidable consequences of raising interest rates to the historical norms, and the interest rate trap will becomes apparent to the financial markets, including gold. The Federal Reserve is already reacting to the problem by deliberately keeping interest rates down. Blaming that policy on the employment problem, though, might someday soon become a slight of hand played to an increasingly skeptical audience. The Everyman edition of Edward Gibbon's History of the Decline and Fall of the Roman Empire comprises some six volumes and nearly 4000 pages. Rome was not built in a day and, as Gibbon’s work reveals, it was not lost in a day. What we are challenged to recognize with respect to U.S. monetary policy today is not an event, but a process. The decline of the dollar since the United States went off the gold standard in 1971 has not come in a handful of sudden, cataclysmic events like formal devaluations, but gradually and consistently, over a period of four decades coinciding with the steady decline of the dollar. That process is likely to continue. Since the early 2000s, when gold’s most recent bull market began, periods of stagnation like the one we are in now have reaped the highest rewards for the patient buyer. The lesson here is one as old as the gold market itself: The time to buy is when the market is quiet. As an old friend and client used to say (he recently passed away) when the market was stuck in the $300 range: It is not a question of if but when. He lived to see his prediction come true and his estate reaped a small fortune from his gold coin holdings. The continuing inability of the U.S. federal government to come to grips with its fiscal problems largely explains the enduring, some would say stubborn, presence of gold coins and bullion in millions of investment portfolios around the world – including those of central banks, hedge funds and sovereign wealth funds. Until such time as fiscal rectitude takes hold in the halls of Congress -- an unlikely proposition any time soon – current gold owners are likely to hold tight and new gold owners are likely to continue joining their ranks. In the end, contemporary gold owners by and large do not own gold to become wealthy, but to protect the wealth they already have. "There's a growing gap between what central banks are telling us about inflation versus what people are really experiencing in day-to-day life. There are a lot of reasons for this but I think it's important to understand that [nation] states are broke, and therefore they are looking at ways to default on their own citizens. And inflation is one of those mechanisms. So it's not surprising they don't tell you that's what they are doing." - Philippa Malmgren, former White House official, White House liaison to the Federal Reserve and member of the President's Working Group on Financial Markets (Plunge Protection Team) in a King World News interview. A little USAGOLD history. . . . Pictured are News & Views hard copies from 1999 just before gold began its secular bull market. News & Views was Review & Outlook's popular predecessor at a time when gold-based publications were few and far between. The "Big Breakout" headlined in the November, 1999 issue refers to a price jump from $260 to $330 per ounce. Your editor sees a good many similarities between that period and now. – Stocks are up about 2% year to date and gold is up about 8%. So after all is said and done – after all the saucy anti-gold and pro-stocks rhetoric is filtered through the various media – the inarguable reality is that gold has been a better performer than stocks thus far this year. . . .and by a significant margin. – There is much talk about gold demand being down in China thus far this year, but that development needs to be put into context. Physical metal, not paper trading, dominates the China gold market. Simply put, today there is not as much physical metal available for China’s import as there was in 2013 when the London-Zurich-Shanghai pipeline was operating at full tilt. Most of that gold was sourced from ETFs and those funds are now once again net buyers of the metal. With ETF metal now off the table, of course China’s imports are down. Gold market pundits, both friend and foe, should stop fretting about short-term Chinese demand and focus on the fact that whenever large quantities of the physical are made available the Chinese are all too willing to take it up. Put enough physical metal on the market and you will see China’s imports rise. – Gold stocks are said to lead the physical metal particularly when a major turnaround is in the offing. Gold stocks this year, using the XAU Index as an indicator, are up 25%. This bodes well for the metal itself going into the annual kick off to the Fall investment season in September. As noted earlier, gold metal is up 8% thus far this year – so there is a considerable gap between these two components of the gold market. – Fiat money is probably here to stay, but its presence is easily addressed in the private investment portfolio through the simple expedient of gold ownership. 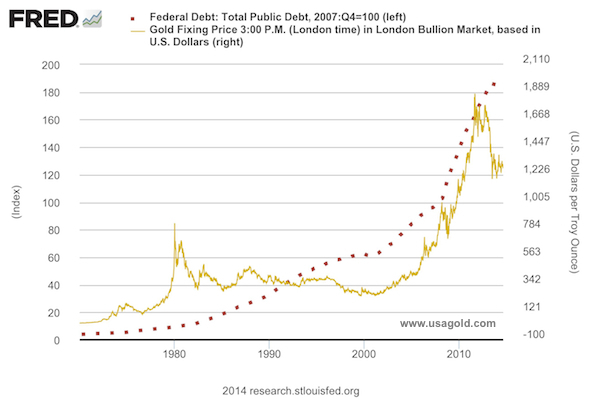 Recall gold's price history since fiat money was first introduced in 1971. Then recall its history since 2008 — and the dawn of the crisis which Jackson Holers still find themselves addressing six years later. As the Sun's editor so incisively states in the same editorial quoted above: "We celebrate, say, the sages of Berkshire Hathaway. Yet the value of a share of Berkshire has plunged to something like 159 ounces of gold from the 269 ounces of gold a share was at, say, the day that George W. Bush acceded to the White House." (Perhaps that nettlesome fact of economic life is what drives the Sage's antipathy to yellow metal.) Put yourself above the jury-rigged economics — Jackson Hole or otherwise. Save in gold. – Richard Russell remains one of my favorite analysts simply because he is about as down-to-earth as they come. In a recent interview at KWN, he warns of a stock market crash saying that "trees don't grow to the sky." He advises: "Stay with silver and gold and pray for the good of the nation. I must say that I'm fascinated to see how the US will deal with its surging and compounding debts. What worries me is the continuousness of those two eternals — Inflation and War." Some more hard won wisdom from a money master: "I have picked silver and gold as my form of capital preservation. Both are trading solidly in fixed ranges, which is fine with me. If the stock market drops 25% and a money manager is down 23%, he considers it a good performance. That's not the way I see it. If the stock market is down 25%, and gold remains in its trading range, I consider that an excellent outcome." – Ernest Hemingway: "The first panacea for a mismanaged nation is inflation of the currency; the second is war. Both bring a temporary prosperity; both bring a permanent ruin. But both are the refuge of political and economic opportunists."